Dolphin Emulator 4.0, the newest major release of the most compatible & performant GameCube and Wii Emulator comes with about 2500 changes. Beta support for the Wii official online multiplayer. This is a feature that has been coming for a long time. More than two years ago, Matthew Parlane and Shawn Hoffman started working on emulating the Wii Wi-Fi networking API in order to run Wii online multiplayer games inside Dolphin. While it was not an easy change in itself, it also required a lot of modifications to core components of the emulator to be implemented properly (for example asynchronous IPC HLE) and a lot of debugging. It is now working well enough that we are releasing it to the public as a beta: don’t expect everything to work, but popular games like Mario Kart Wii or Super Smash Bros Brawl can be played online right now. About two years ago, Ryan Houdek began the implementation of an ARM port of Dolphin, designed to run on powerful mobile phones and other ARM devices in the future. After a long time spent making Dolphin work well on both ARM and x86, Dolphin can now emulate GameCube and Wii games on recent Android phones. This support is still in early alpha stages: crashes happen, it’s slow on Qualcomm hardware because of graphics drivers issues, and it is still missing a ton of features. Nowadays, Dolphin on Android is a two man project: Mathew Maidment is helping Ryan with the UI and making the Android version actually usable. The official website provides 64-bit deb only for Ubuntu 13.04 Raring Ringtail. The PPA contains 32-bit version. Due to the dependency problem, this version won’t work on Ubuntu 12.04 Precise. I have tried to install dolphin for 32 bit as a crazy but i don’t get it. Also tried what you wrote by terminal and it doesn’t work neither. Anything else to get it? 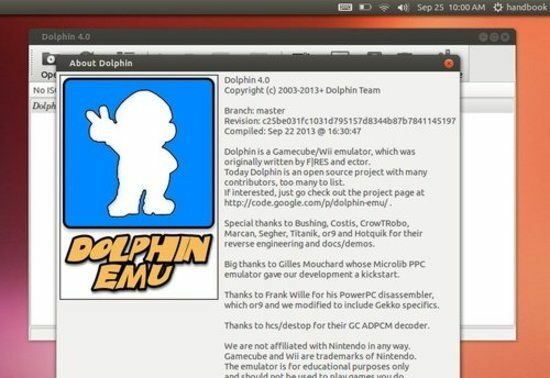 I installed dolphin-emu from ppa:dolphin-emu/ppa. Loading Metroid Prime, it stars good, although with some slow. When the game effectively starts dolphin-em crashs with message. If you’re sure this is Dolphin’s error anyway, post the contents of /home/caco/.dolphin-emu/Dump/bad_ps_0000.txt along with this error message at the forums. Is it possible to bypass that? Well, I have disabled Panic Handler in Config. The message is gone but the game get very slow. I think my CPU and GPU (It must be integrated) does not support dolphin. Shade.